The Bath Indices are outcome measures used with ankylosing spondylitis patients. The BASFI is a set of 10 questions designed to determine the degree of functional limitation in those with AS. It is measured using a visual analogue scale (ranging from 0 being easy and 10 being impossible) and the questions are focused on the person’s ability to perform specific functional tasks. The first 8 questions consider activities related to functional anatomy, such as putting on socks with or without help and climbing steps with or without using a handrail. The final two questions assess the patients’ ability to cope with everyday life. It is included in the ASAS core sets for Ankylosing Spondylitis assessment. The BASFI has shown to have high levels of validity and reliability when measuring functional ability in AS (Ruof and Stucki 1999). Please indicate your level of ability with each of the following activities during the past week. 1) Putting on your socks or tights without help or aids (e.g sock aid). 2) Bending from the waist to pick up a pen from the floor without aid. 3) Reaching up to a high shelf without help or aids (e.g helping hand). 4) Getting up from an armless chair without your hands or any other help. 5) Getting up off the floor without help from lying on your back. 6 ) Standing unsupported for 10 minutes without discomfort. 7) Climbing 12-15 steps without using a handrail or walking aid. 8) Looking over your shoulder without turning your body. 9) Doing physically demanding activities (e.g physiotherapy exercises, gardening or sports). 10) Doing a full days activities whether it be at home or at work. Total all of the ten questions. After this you should divide the number by ten to get an average BASFI score. The higher the BASFI score, the more the patient is limited. The Bath Ankylosing Spondylitis Disease Activity Index (BASDAI) is the gold standard for measuring and following disease activity in Ankylosing Spondylitis (Garrett et al 1994). The questions are answered on a 10 cm VAS, anchored with the labels “none” and “very severe” at either end of the first five questions, and with "0 hours” and “two hours” at either end of the question on duration of morning stiffness. The mean of the two scores for morning stiffness counts as one variable. The final score is defined by calculating the mean of the five items. Final scores range from 0 (best) to 10 (worst). A BASDAI score >4 is internationally accepted to indicate active disease, and most clinical trials of therapy in AS now require that patients have active disease as defined by a BASDAI score of >4 for inclusion. 1. BASDAI to be a quick and simple index, taking between 30 seconds and 2 minutes to complete. 2. BASDAI demonstrated statistically significant (p<0.001) reliability. 3. The individual symptoms and the index as a whole demonstrated good score distribution, using 95% of the scale. 4. Following a 3 week physiotherapy course, the BASDAI showed a significant (p=0.009) 16.4% score improvement, therefore demonstrating a sensitivity to change. To conclude, the BASDAI is user friendly, highly reliable, reflects the entire spectrum of the disease, and is sensitive to clinical changes. Please tick the box which represents your answer. 1. How would you describe the overall level of fatigue/tiredness you have experienced? 2. How would you describe the overall level of AS neck, back or hip pain you have had? 3. How would you describe the overall level of pain/swelling in joints other than neck, back or hips you have had? 4. How would you describe the overall level of discomfort you have had from any areas tender to touch or pressure? 5. How would you describe the overall level of morning stiffness you have had from the time you wake up? 6. How long does your morning stiffness last from the time you wake up? The mean measurement (score) of questions 5 and 6 is added to the scores from questions 1 to 4. This total is then divided by 5 to give the average. This is the BASDAI score. The higher the BASDAI score, the more severe the patients disability due to their AS. To accurately assess axial status (cervical, dorsal and lumbar spine, hips and pelvic soft tissue) of individuals with AS and from these derive a metrology index to define clinically significant changes in spinal mobility. 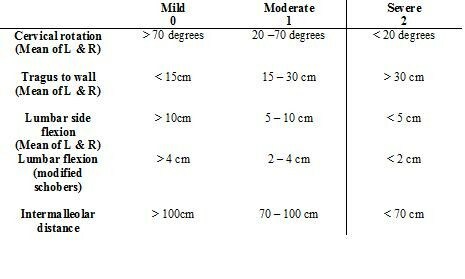 A BASMI score from between 0 to 10 is calculated after the clinical exam is performed and each of the 5 measurements is obtained. The range of severity 0-10 reflects mild to moderate disease activity and functional ability in the spinal column. The higher the BASMI score the more severe the patient’s limitation of movement due to their AS. The impact of AS from the patients’ perspective encompasses all aspects of disease including activity, function and structural damage, in one summary measure. The patient global assessment is useful in clinical practice, and may be the single most responsive measure in this setting. The Bath Ankylosing Spondylitis Global score (BAS-G) is consistent with the other measures in the core set, utilizing the ‘in the last week’ approach to obtain a snapshot of current patient status but also it also refers to the patient’s average well-being over the last 6 months, which can be helpful to describe longer-term disease progression. The mean of the two scores gives a BAS-G score of 0 – 10. The higher the score, the greater the perceived effect of the disease on the patient’s well-being. 1) How have you been over the last week? 2) How have you been over the last six months?